The purpose of this site is to explain current international standard paper sizes, covered by the ISO 216 Standard, and to provide size charts to allow a quick lookup of sizes. 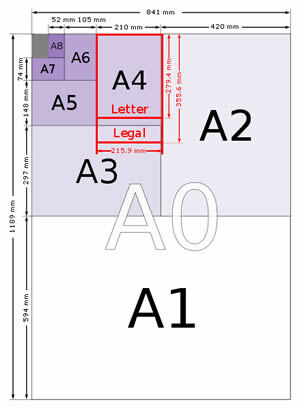 There are some requirements for paper sizes where the A series isn't suitable and to take these into account the B series paper sizes were introduced. In order to explain the rationale behind the B paper sizes, we are going to need a bit more maths. The B series paper standards are also based around the 1:root 2 aspect ratio, but in order to provide sizes not covered by the A series, the length and width of size B(n) are defined as being the geometric mean of size A(n) and size A(n-1). The benefit of using the geometric mean is that the magnification factor between A1 and B1 sizes is that same as the one that scales B1 to A0. 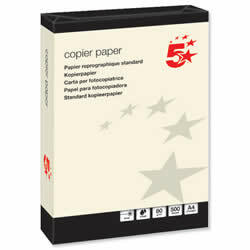 The C series sizes were introduced to define the sizes of envelopes suitable for the A series paper sizes. This is also based on the root 2 aspect ratio and the size of a C(n) envelope is defined as the geometric mean of paper sizes A(n) and B(n). This leads to a C(n) envelope which nicely holds a sheet of A(n) paper unfolded. This sizing also has some neat properties when dealing with folded paper, so a C4 envelope will hold a sheet of A4 paper unfolded, a C5 envelope will hold a sheet of A4 paper folded in half once parallel to its shortest sides and a C6 envelope will hold the same piece of paper folded twice. Untrimmed raw paper formats for commercial printing are covered by ISO 217 which defines RA and SRA paper paper sizes. These sizes are slightly larger than the corresponding A sizes to allow for ink bleed during the printing process. Full RA & SRA definitions here. The ISO 216 paper sizes have some useful properties for reducing and enlarging in print or photocopying such that the scale factor needed to convert from A3 to A4, at 71% is the same as the scale factor to convert between A4 and A5, A5 and A6 and so on. The following link covers Full Tables of Magnification Scale Factors for A & B Paper Sizes. The A series paper sizes are defined by the area of A0 being 1 square metre. The areas of other sizes are then: area of An is 1 divided by two to the power of n. More information on areas of standard paper sizes here. The United States use their own standard paper sizes, Letter, Legal and Ledger/Tabloid being some of the most common. There is an ANSI standard with sizes A-E and architectural paper sizes, the Arch series again with sizes A-E. Both of these series have been extended for expediency with the additions of ANSI B+ and Arch E1. See American Paper Sizes for more information. Billboards and posters use a variety of sizes some of which are in the standard paper sizes (ISO, ANSI and Arch) others of which are specific to the poster and billboard forms, this is expecially true of movie posters. Click the following links for Poster and Billboard sizes. Make your selections in the drop down boxes to find out the weight for your selection, click this link for the number of sheets in a ream or quire. ISO 536 defines paper weights and grammage, which determine the thickness of the paper. The US and North America use an entirely different definition for paper weights based on basis weight and stock types. Tables of conversions between basis weight by stock type and grammage are also provided. Not all paper is the same shade of white and Whiteness, Brightness and Shade are different measures used to discriminate between various shades of paper. Paper can be viewed as Portrait paper or Landscape paper depending on how you look at it. Viewed with the shorter sides at the top and bottom it is said to be Portrait and viewed with the longer sides at the top and bottom it is said to be Landscape. Before the introduction of ISO 216 many paper sizes were in use around the world. British Imperial paper sizes were common in countries which had been part of the British Empire, Japan had traditional paper sizes and a variety of sizes were used across European countries.